A. E. Decker hails from Pennsylvania. A former doll-maker and ESL tutor, she earned a master’s degree in history, where she developed a love of turning old stories upside-down to see what fell out of them. This led in turn to the writing of her fantasy novels, The Falling of the Moon and The Meddlers of Moonshine. A graduate of Odyssey 2011, her short fiction has appeared in such venues as Beneath Ceaseless Skies, Fireside Magazine, and in World Weaver Press’s own Speculative Story Bites. Like all writers, she is owned by three cats. 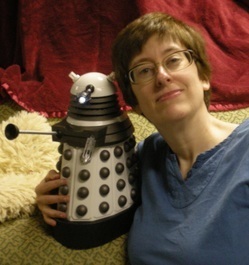 Come visit her, her cats, and her fur Daleks at wordsmeetworld.com. According to your bio, you hold degrees in English and colonial American history. Tell us a bit about the role the English language played in unifying (or dividing) the colonies? Had to start with a tricky one, eh *chuckle* This would probably be better answered by a linguist than a historian of my background, but I’ll give it a go. English is a piratical language, in that throughout its evolution, it has been very happy to grab words, syntax, and grammar from other languages. Modern English is littered with words stolen from all the other nations that came to settle (or pillage, depending on your perspective) the land of America. I have read a theory that the fluidity and adaptability of English is one of the reasons it’s considered a universal language today. I can only imagine that it did help unify the colonies as British territories. New York, for example, was primarily Dutch. My own state of Pennsylvania had a heavily German influence. But they were relatively isolated amongst the British territories, and in the end, they were squeezed out, even though the original language’s influence still lingers in the names of streets and rivers and suchlike. That’s a highly simplified answer, I’m afraid, but we’d really have to delve into some finicky historical details to get at a better one. Sage and Savant: Oh, but we love finicky historical details and may just come back to you on this one. You also mention being an ESL tutor. What are some of the biggest challenges adults face when trying to learn English as a second language? An adult speaker’s greatest challenge to learning English depends quite strongly on their native language. My European students mostly had difficulty with pronunciation and context. For those who did not speak a Romance language, grasping English’s convoluted grammar rules was a huge challenge. As I mentioned above, English stole a lot of its vocabulary from other languages along the way. It’s why we have irregular verbs. It’s also how we got situations where “cow” refers to an animal, and “beef” refers to the animal as something you can eat. We got “cow” from the Saxons and “beef” from the Franks around the time of William the Conqueror. Getting that distinction across to a non-English speaker requires a lot of explanation. Also, we have a large variety of verbs, all with their subtle nuances. To “snicker” doesn’t mean quite the same thing as to “giggle.” As a writer, I appreciate this variety, but it does make teaching the language confusing. I’m not even going to get into explaining count and noncount nouns. That confuses even native English speakers! 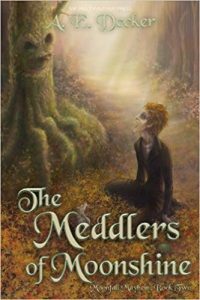 The except we read this month is from The Meddlers of Moonshine, the second book in your Moonfall Mayhem series. In the first book, The Falling of the Moon, Ascot, the heroine, is guided by a book of fairytales. What are some of the common fairy tales you mix together in these books? 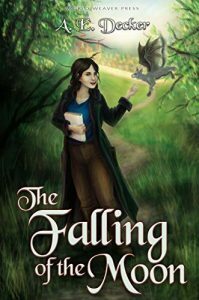 The inspiration for the first book, The Falling of the Moon, was “Puss In Boots,” only I had a vampire’s daughter inherit the cat, instead of a miller’s son. Other fairy tales I’ve referenced include “Little Red Riding Hood,” “The Three Pigs,” “Cinderella,” “Snow White”…and I’m probably forgetting a few. I just finished the draft of book four, A Trick of the Moonlight, which references several Russian fairy tales, such as “Vasilisa the Beautiful,” as well as going back to “Little Red Riding Hood.” While I continue fairy tale references throughout the series, book 2, The Meddlers of Moonshine draws a lot of its references from Gothic tales, such as Frankenstein, while book 3, Into the Moonless Night, draws from Tolkien and other high fantasy. Book 4 takes its inspiration from the Robin Hood myths, while book 5 will draw on Arthurian legends. Tell us a bit about the role of the Big Bad Wolf? My Big, Bad Wolf is named Dmitri, and he’s a very cultured, talking wolf with a passion for Dostoyevsky. He rather resents the “Big Bad” label. 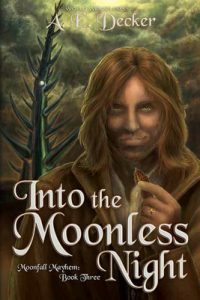 In book 3, Ascot and company are traveling through the Clawcrags, the land of the shifters, in an attempt to rescue a member of their group, Catch Starthorne, a Smilodon-shifter. As it turns out, all the wolf-shifters fought a war with the rest of the shifters several centuries ago. They emigrated to Shadowvale, Ascot’s homeland, and became werewolves. The shifters still in the Clawcrags don’t like wolves very much because of this history, which causes trouble for poor Dmitri. Dmitri finally gets his time in the spotlight in book 4, A Trick of the Moonlight. March is Women’s History Month. Who is a woman in history you most admire and why? I admire so many women from history, just because of the odds they faced to be heard or respected. 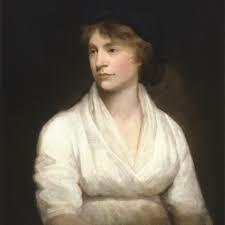 Just for today, I’m going to choose Mary Wollstonecraft out of the multitude. She dared to live an unorthodox life and was both respected and penalized for it. Her Vindication of the Rights of Women is still a fascinating read. Also, she was the mother of Mary Shelley and inspired Jane Austen. Of course, she was a woman of tremendous privilege for her time. I sometimes wonder about all the unspoken heroines, the ones who were likely illiterate and overlooked by society. A lot of them have been–must have been–completely lost to history, because you really have to dig into what evidence we have to learn anything about their lives. As a woman science fiction writer, what are some of the differences women bring to science fiction writing? I rather dislike dividing novels into “men’s work” and “women’s work,” even though I acknowledge there is often a difference in the way we write. Even though women have gained status in recent decades, there’s no doubt that men still have the upper hand where privilege is concerned. Therefore, women writers have the perspective of an outsider, looking in. I’ve heard a lot of women writers say we write male characters better than male authors write female characters (generally) because it is necessary for us to study men, because our success often still hinges on pleasing them. I think there’s some truth to that, unfortunately. I’d say, in general, that women writers are more attuned to social issues. The science fiction they write is more often concerned with who we will be as people, as a society, in the future, rather than what new technologies we may discover. There are probably fewer explosions in women authors’ work, too. Or am I being too facetious? Who is/are your favor author(s) and why? I love many authors, but I will always give the prize to Sir Terry Pratchett. I am a huge advocate of humorous writing. A lot of people tell me humor is very difficult to write well, and yet, humor rarely seems to get the respect it deserves. It certainly tends to win fewer awards than books or movies dealing with Deep Serious Issues. Yet, I often believe the only way to tackle serious issues is to laugh at them. 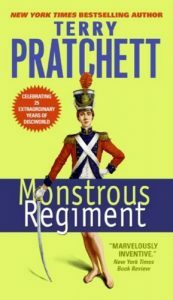 Take the whole question of women’s issues we were discussing–Terry Pratchett went into it in Monstrous Regiment, and dealt with it both thoughtfully and humorously. He made you understand that, at its root, the whole issue is vaguely ridiculous, because both men and women are people–flawed, bull-headed, and wonderful. The ability to make you both laugh and think is a rare gift, and Pratchett was a master at his craft. I strive to do the same, in my own work. Terry Pratchett died the year The Falling of the Moon came out, and I dedicated the book to him. I’m still waiting for Death to relent and bring him back.